End of over 20 ( 13 Runs )KKR 203/5 Nitish Rana* 89(48)Dinesh Karthik 0(0) 200 runs for KKR 19.6Moeen Ali to Nitish Rana. SIX, SIX! But that won't be enough! BANGALORE WIN BY 10 RUNS! A flighted ball landing full outside off, Rana gives it the full whack of his bat and sends it flying over long off. Smiles in the Bangalore camp. They have survived the Russell onslaught this time. Spare a thought for Nitish Rana, what a knock he played! Absolutely amazing game of cricket. 5 wickets down for KKR. Out batsman is Andre Russell 19.5Moeen Ali to Andre Russell. out, OUT! Run out! Russell departs. The game was already over but there was no way that Bangalore could breathe easy when this man was out there. A low full toss on middle, Russell slaps it to deep mid-wicket and finds the fielder at long on. Russell runs slowly and Virat takes advantage of that by throwing it to Ali at the bowler's end who removes the bails. Russell knows that he is out and runs off and the replays too show the same. 19.4Moeen Ali to Andre Russell. no run, Misses! And that is the game! Well, it should be! A flighted ball outside off, Russell goes for the huge slog but misses the ball and Parthiv collects it well under pressure. Kohli is jumping up and down in excitement. Moeen needs to make sure that he does not bowl a no ball now. 19.3Moeen Ali to Andre Russell. SIX, SIX! Here comes the first one... He needs to hit the remaining ones over the fence too. Moeen drops it short and on off, Russell latches onto it and hoists it over the bowler's head for a maximum. 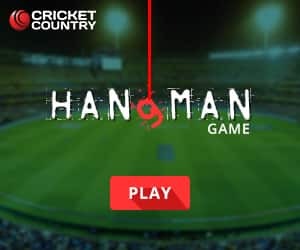 19.1Moeen Ali to Nitish Rana. no run, Excellent ball to start off! Rana gets inside the line and looks to hit it over fine leg but misses the ball. The ball just whizzes past leg stump. Not given a wide as the batsman moved out of his position. End of over 19 ( 19 Runs )KKR 190/4 Andre Russell* 59(22)Nitish Rana 82(45) 18.6Marcus Stoinis to Andre Russell. SIX, SIX! Three in a row! How has this one gone for a maximum? Almost in the blockhole, Russell looks to smash this over long on but the bat turns in his hand and the ball still travels over long off. It clears the rope and Kolkata still believe due to the power of this man! The 100-run partnership comes up! 50 runs for Andre Russell 18.5Marcus Stoinis to Andre Russell. SIX, SIX! Huge! Two in two! Stoinis misses his mark once more. Russell smashes it over long off. The ball goes way back into the crowd. 30 needed off 7 balls now. That six also brought up the fifty for Russell. 18.4Marcus Stoinis to Andre Russell. SIX, SIX! Russell has murdered this delivery! It's hit with brute force! Stoinis delivers it short and on off, Russell is waiting for that, as soon as the ball reaches in his zone, he has pulverized it over mid-wicket. 18.3Marcus Stoinis to Andre Russell. no run, What a brilliant over this has been so far. Another dot ball! Stoinis bowls the bouncer and Russell ducks under it to evade the ball at the last moment. 42 needed off 9 balls now. 18.2Marcus Stoinis to Andre Russell. no run, Low full toss on middle, Russell hammers it but straight to extra cover. Ali under pressure makes an excellent stop. Dot ball again! 42 off 10 needed. 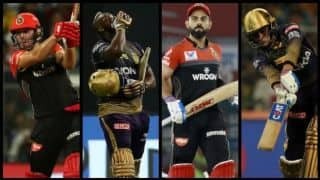 Andre Russell clobbered a whirlwind 65 off 25 balls, but this time it was not enough as Royal Challengers Bangalore trumped Kolkata Knight Riders at the Eden Gardens to claim their second win of the season, defending a total of 213/4. 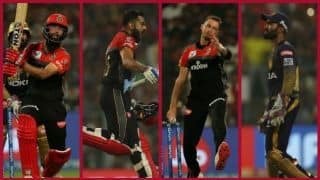 It was Moeen Ali’s blistering 27-ball 66 that had set base for what turned out to be a stunning assault by Virat Kohli (100) in the death overs to help RCB to a massive total, but Kohli and RCB would have been vary of the Russell threat, and they managed to stave off the West Indian. 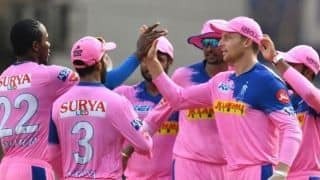 Nitish Rana also played a magnificent hand of 85 off 46 balls, but failed to arrest his team’s slide that now stands at four consecutive losses. 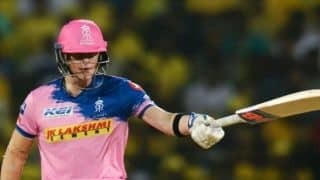 Chasing the big total, KKR lost Chris Lynn early to Dale Steyn in the very first over, with a slower one that Lynn chipped to mid-off fielder Virat Kohli. Sunil Narine was kept quiet by some terrific bowling from Steyn and Navdeep Saini up front and Naine departed to Saini, caught behind for 18 off 16 ball. No.3 Shubman Gill succumb to Steyn, again caught by Kohli at mid-off for nine. 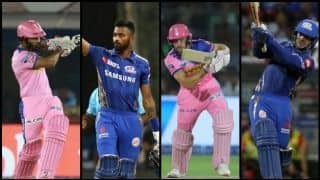 Nitish Rana and Robin Uthappa then struged in the middle to time ball and even while running between the wickets KKR allowed the asking rate to creep up. 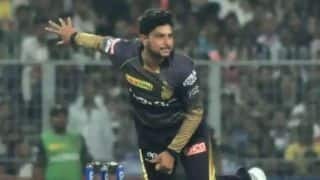 Mohammad Siraj and Marcus Stoinis were tidy in the middle overs and by the time Uthappa got out for a sloe nine off 20 balls, KKR had managed just 79 in 11.5 overs. With 133 required off 48 balls, Andre Russell joined Rana in the middle who got his eye in and started to open up, reaching 33 off 23 balls. 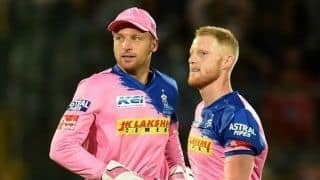 Russell began with a six off Yuzvendra Chahal and then tonked the wrist spinner for three straight maximums in the 15th over to bring the equation down to 93 off 30 balls. Rana joined in the act with a four and two sixes odd saini’s final over. Siraj’s final was taken for a six and four by Russell before Rana took on Dale Steyn two sixes and four. Yet the equation was a stiff 43 off 12 balls. 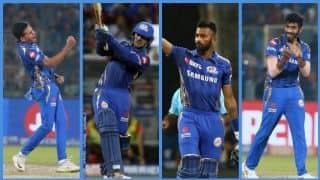 Stoinis was entrusted with the 19th over of the chase even though he started well with three dots first up – apart from a wide – Russell managed to muscle his way to three sixes, to take 19 off the over and also score the fastest fifty of IPL 2019. 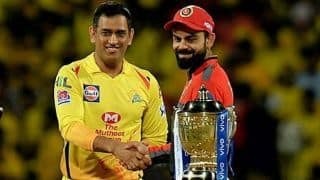 Kohli then called on the experince of Moeen Ali in the final over and after giving away just one run in the first two balls to Nitish Rana, he got crucial dot against Russell off the fourth delivery, to take a KKR win out of the equation.